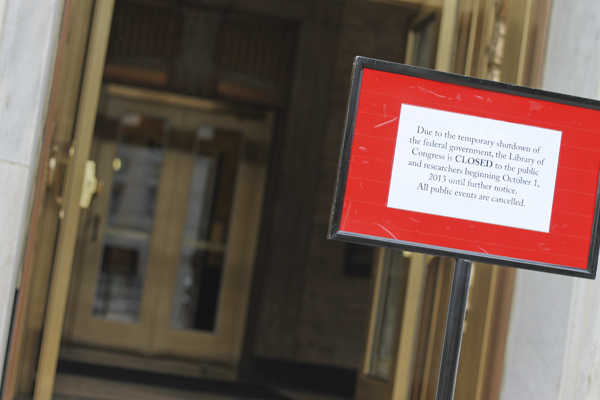 A sign in front of the Library of Congress notifies passerby that the building is closed to potential visitors. GW professors and students have been restricted access from typically free resources such as the library and Smithsonian museums. If the government shutdown extends into this week, more students and faculty could be furloughed or forced to shake up their class schedules. The shutdown has had few tangible effects so far at GW, but it will become visible if the city runs out of money this week. Still, some researchers have hit roadblocks since federal agencies closed at the beginning of the month and faculty have had to look for data in new places. About a dozen faculty members, mostly in the School of Public Health and Health Services, are funded partially or completely by the Intergovernmental Personnel Act. Schools are still deciding whether to absorb pay or furlough the faculty members, University President Steven Knapp said at a Faculty Senate meeting Friday. So far, research grants and financial aid have been largely unaffected, Knapp said. “However, that situation could change, and could effect change fairly dramatically in the coming days. It’s a very fluid situation, and we continue to carry the problems and some surprises,” he said. Lynn Goldman, dean of the public health school, said the implications were somewhat confusing for faculty, who need to start filing grant continuations soon for a January deadline. The school also receives funding from the D.C. government, which will run out of reserves in the coming days. “Over time, it will have more and more of an effect, so it takes a while for the bad effects to set in,” she said. Knapp added that students in the GW Law School, School of Medicine and Health Sciences and public health school have been furloughed from credit-bearing internships. Those schools will have to create contingency plans to make up the credits if the students are unable to work for much longer. The Center for Civic Engagement and Public Services estimated about 50 students whose federal work-study jobs are at federal agencies and are unable to work, Knapp said, but that all other students should receive aid as usual. Faculty have also had to alter their class plans, as websites like the U.S. Census Bureau have been shut down for the past week and a half. Researchers are still able to use grants that have already been awarded, but the Health Resources and Services Administration instructed professor of health policy Marsha Regenstein to pause her research on community-based teaching hospitals, which is funded by a $2.3 million grant. Faculty also said students have had to pause research for major papers because federal data is unavailable. Anthony Yezer, a professor of economics, said graduate students in a regional economics class rely on data from the census, Bureau of Economic Analysis and Bureau of Labor Statistics websites for research, all of which have been shut down since last week. Research limitations are proving particularly difficult for seniors who rely on government data for their thesis writing, he said. Other professors have had to adjust their syllabi because students have been unable to complete assignments. Benjamin Hopkins, an associate professor of history, said some of his students planned to use materials stored at the National Archives and Library of Congress for their theses, which are now unavailable. If the shutdown lasts longer, he would have to come up with alternate research plans with the students, he said.